Do you like fine art and music? You need to travel Boston's "Avenue of the Arts." Huntington Avenue is nicknamed Boston's Avenue of the Arts. 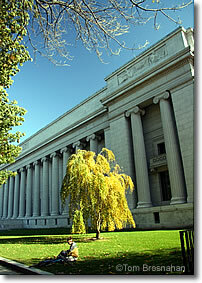 Home of the Boston Symphony Orchestra, Symphony Hall, 301 Massachusetts Avenue at Huntington Avenue, also hosts many other headline musical performances. The New England Conservatory at 290 Huntington Avenue offers many performances by students, faculty and visiting artists. Known for its programs in experiential education (learn by doing), Northeastern has a prime location among Boston's arts institutions at 360 Huntington Avenue. Among Boston's most prominent art schools, MassArt at 621 Huntington Avenue has its own exhibits, tours and talks. Museum of Fine Arts, Boston MA.